Double check the Social Security Numbers for you, your spouse and your dependents. Everyone’s numbers should be on the form, and they should all be correct. Also, realize that multiple people can’t claim one dependent. This is a common mistake among siblings who contribute to their parents’ care. If you plan to take a credit for child care or some other purpose, you will need the correct identification numbers. This goes for the identification numbers of those you pay as part of a business you own. Make sure your filing status matches up with your spouse’s. You can’t be married filing jointly, while your spouse marks that you are married filing separately. You also need to make sure you have checked the right box if you are single, or filing as head of household. And remember: You can only have one filing status. Is your address filled in correctly? I have to admit that I once transposed two numbers on my address. Luckily, the nice people across the street who received my tax refund were kind enough to bring it by. If you are having your refund direct-deposited, make sure all of the information is correct. This means you need to have your bank’s routing number correctly entered, as well as your bank account number. I’m guilty of this mistake as well. It took for-ev-er to get it all straightened out, and in the end I got a paper check anyway. After putting it all together, there are a number of folks, according to the IRS, who neglect to sign the return. If you owe money, this could actually result in interest penalties being assessed. If you are married and filing jointly, your spouse needs to sign the return as well. This is a biggie. When you file a tax return — especially if you itemize — you need to have documentation to back up your deductions. Charitable deductions need to be accompanied by receipts showing the date, amount and name of the non-profit. You should also have documentation to back up deductions you take for medical expenses, property taxes, mortgage interest and business expenses. Double check your credits. You should also do a rundown of new credits. There are more than 300 changes to the tax code for 2009 taxes. This means that you might eligible for some credits you don’t even know about. On the flip side, double check your eligibility for the tax credits you do take. Many people claim credits they shouldn’t, and that can mean interest and penalties. Just like you had to double check your math in high school, it is a good idea to double check your math work on your tax return. 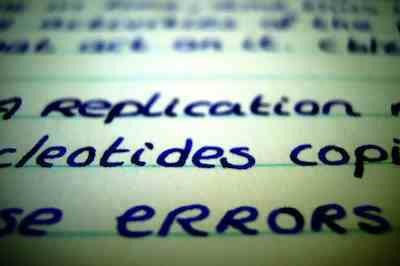 Math errors can lead to still greater errors later in your form. Get out the calculator and make sure you’ve added and subtracted properly. Go over your deductions sure have correctly added up your taxable income. This is one of the mistakes that can cost you big, if you aren’t careful. Then, when figuring your tax liability, make sure that you are in the right column of the tax table. After you have determined your tax requirement, take a short break, and then look at the table again — just to be sure. Your tax return is an important document, and it is easy to make mistakes. Before submitting it in any form, look over the completed return and check for errors. This applies even when a professional has prepared your return. Do a check to make sure everything really is in order, and you will be more likely to avoid errors that could cost you in terms of time and money. Also for US readers, make sure that all your 1099s (INT, DIV, MISC) etc match up on the return. These statements are reported to the IRS and since IRS does not know your cost basis for your investments, they just assume it to be zero. Once I forgot to report capital gains on a municipal bond fund which in total amounted to about $100 and within a few months of filing I received an audit letter with IRS estimation of taxes due on tens of thousands of dollar closer to a few thousand dollars plus interest and penalties. It was resolved ultimately after few iterations with IRS but it is not a pleasant experience fixing a tax problem which in hindsight should never have occurred. Plus as you keep working on the problem with IRS, interest and penalties keep accruing. An omission or error on the computer tax software or paper tax forms can result in a delay of your refund check or cost you money. Know what to watch for when you prepare your tax forms, and make a checklist to avoid common tax-filing mistakes. Will the IRS give you a break if you use a software program and the software makes a tax error causing you to incur a tax penalty? I can’t say what the IRS would do, but you might get something of a small break if it is truly a software error and not a human input error. In the end, though, it’s best to get things resolved as quickly as possible, and pinpoint the problem. Even though I have someone else do my taxes, I look over them myself, just to double check. It might be worth it to do the same if you use a tax prep software program. You mention that the filing deadline for Canada is April 30th but then write about American stuff. One of the biggest issues I see that a Canadian reader may get wrong based on this article is filing status: There is no such thing as joint filing in Canada. I think that when writing articles to an international audience you address the specific country. If you are going to write about US taxes, then make the article about US taxes by making it clear that is what the topic is.